Feel alive with Alive! multivitamins. Alive! multivitamin gummies for Women 50+ is a complete formula designed specifically for women over 50 with more than 16 vitamins & minerals including a full B-complex. Alive! 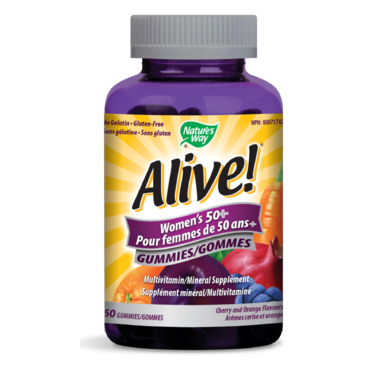 gummies for Women 50+ help in the maintenance of skin and bones as well as support immunity so you can feel alive everyday. Plus it’s the only gelatin-free multivitamin gummy and comes in two great flavours – orange and cherry. Helps in the maintenance and support of skin and bones. Directions: Adults take 2 gummies daily. Take with food a few hours before or after taking other medications. Do not take if you have an allergy to Asteraceae/Compositae (daisy) family. One of the main ingredients in this product is glucose fructose. Not healthy!